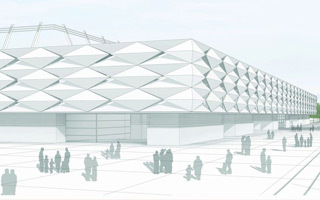 Though with no specific date set, major update in the design of Luxembourg’s national stadium is coming this autumn. StadiumDB.com understands it’s not a shift in principles, but amendments of the approved concept. One major change includes a hybrid field instead of natural one, which should increase its durability and versatility of the entire stadium. In terms of safety, additional fencing and improved surveillance systems will ensure safety for all spectators. Despite previous plans, the stadium will not include an underground parking lot beneath the whole building. Instead, a smaller one will be created under part of the structure. Still, with the above-mentioned alterations, the entire budget of stadium’s construction should exceed €59 million ($65m), a million above initial estimates. Construction of the 9,595-seat stadium is expected to begin in 2018 and last until 2019. After opening the new football-specific venue will relieve the dated Stade Josy Barthel from hosting national team games.